Well, who'd have thought it? A brewery's limited run New England style IPA proving so popular it's back for another run. While the longevity of the NEIPA remains to be seen, we know of some breweries where theirs has become the backbone of the business and, certainly, it seems drinkers still can't get enough of the haze. 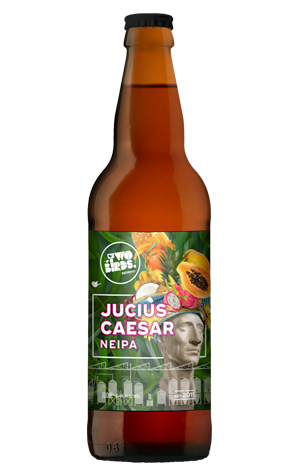 So Two Birds is giving the people what they want by bringing Jucius Caesar back and giving him a wider, big bottle release this time around too. Like the Hope Super Super Juicy Double NEIPA released around the same time, it's not the murkiest of beasts, but it does deliver on the juicius-ness. Indeed, take your time over the beer and it seems to serve up a few fruit-filled courses. On first pouring, the Crafty tasters picked out lime, gooseberry and even something of a piña colada bent; the beer then settled into a more typically tropical rhythm dominated pineapple and grapefruit. It's not as fat on the palate as some NEIPAs, almost lean, in fact, with a prickly hop-driven finish in place of bitterness. Although, when we say finish, there was a little surprise still to come. Returning to the bottle after working through a few other samples, the aroma had turned into none other than that of a bag of fresh homegrown. Saturdays at12.30pm only. Please book online via the Two Birds website.